The stained glass roundel c.1225 in the east window of the St Birinus Chapel. 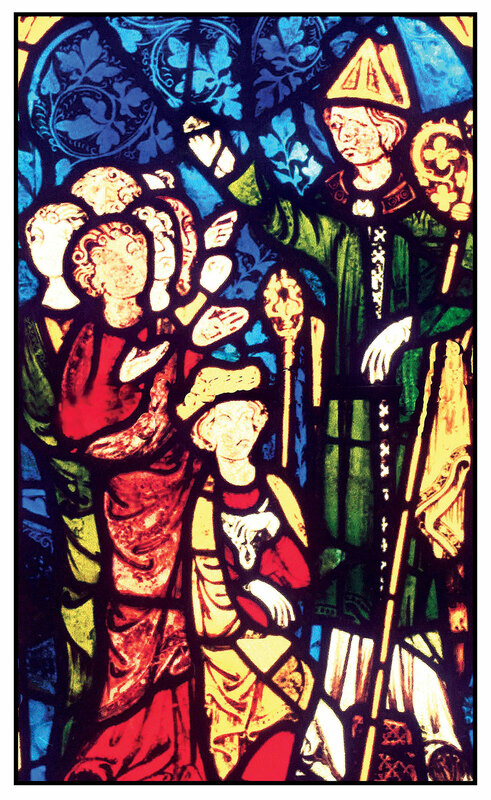 East Window panel depicting Birinus preaching before King Cynegils and some of his people. In the 7th century, an Italian monk named Birinus was consecrated bishop in Milan by Archbishop Asterius. Subsequently, he was sent to Britain by Pope Honorius I to continue the conversion of the Anglo-Saxons to Christianity. Bishop Birinus’ original plan was to penetrate well into the interior of the country where no teacher had been before. But we know from Bede’s Ecclesiastical History that ‘on arriving in Britain and first coming to the nation of the West Saxons, where he found all to be confirmed pagans, he thought it more useful to preach the word there, rather than to go further looking for people to whom he should preach’. In AD 635 King Oswald of Northumbria, who had already been converted to Christianity by Celtic Christians in Iona (Scotland), wanted to marry the daughter of Cynegils, King of the West Saxons, and therefore came to Dorchester to visit Cynegils. There he found Cynegils receiving instruction in the Christian faith from Birinus. 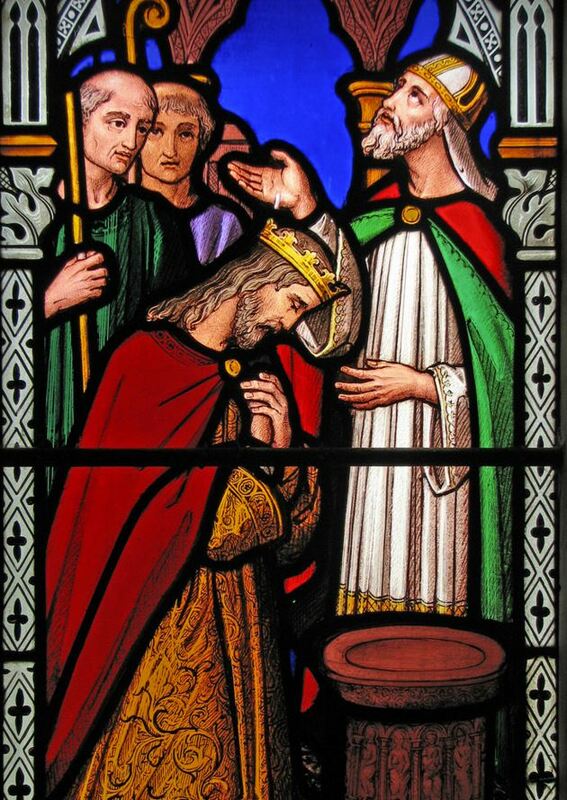 The outcome was that Birinus baptised Cynegils ( probably in the nearby River Thame), with Oswald standing as godfather. The two kings then granted land to Birinus in Dorchester for the establishment of his episcopal see and cathedral church. 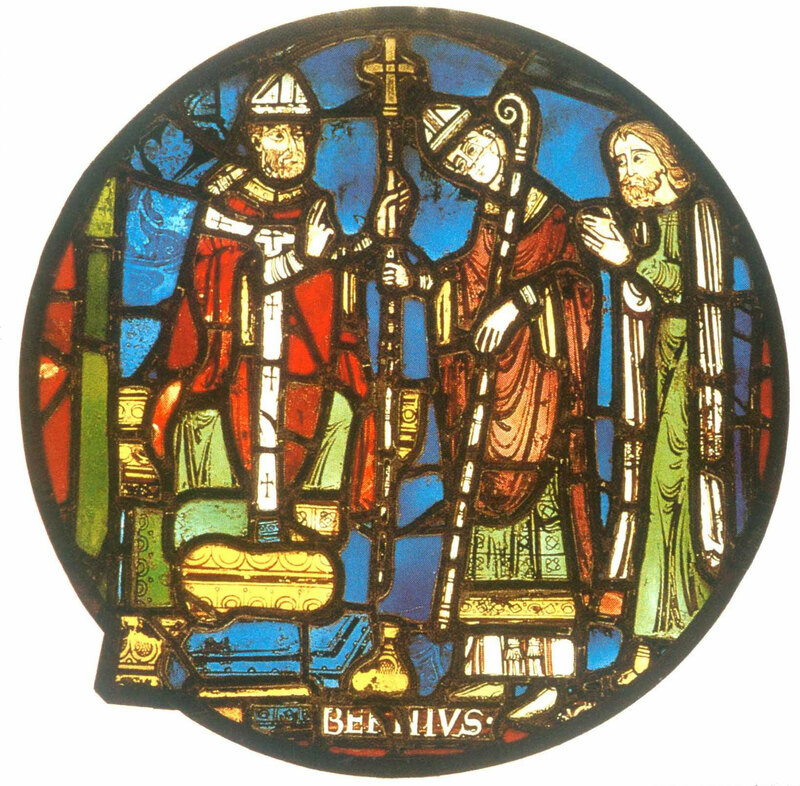 Birinus thus became the first Bishop of the West Saxons. Birinus died about AD 650 and was buried in Dorchester; he was canonised soon after. His relics (bones) were moved to Winchester around 690 by Bishop Hedda of Winchester, but they were moved again to new shrines in 980, by Bishop Ethelwold, and in 1150, by Henri de Blois. In the early part of the 13th century the Augustinian Canons of Dorchester claimed to possess the relics of Birinus, and this was accepted on very slender evidence following an enquiry instigated by Pope Honorius III and presided over by Stephen Langton, the Archbishop of Canterbury. According to one living authority, the Birinus ‘cult at Dorchester appears to have been an early 13th century publicity stunt’. Whatever the truth about the Birinus relics, the Abbey became a popular place of pilgrimage. This led to an extensive programme of rebuilding including in ca 1320 the south choir aisle and a marble shrine dedicated to St Birinus. The shrine was destroyed and the relics lost in 1536, but fragments of the vaulting were found in a walled-up doorway in the 1870s and these were incorporated in the 1960s in the reconstructed shrine that stands today in the south aisle. The stained glass roundel illustrated at the top of this page, dated ca 1225, is in the east window of the St Birinus Chapel. It shows Birinus (spelt Bernius) with bowed head being blessed by an enthroned archbishop, probably Asterius of Milan who consecrated Birinus for his mission to Britain. The third person is a layman, shown praying. The Great East Window has a panel depicting Birinus preaching before King Cynegils and some of his people.